Our funders have high expectations, and so do we—specifically, that IRD/Blumont employees and consultants will use the funds entrusted to them in the most responsible and targeted way possible, to empower communities in some of the most challenging environments in the world to achieve self-sufficiency. 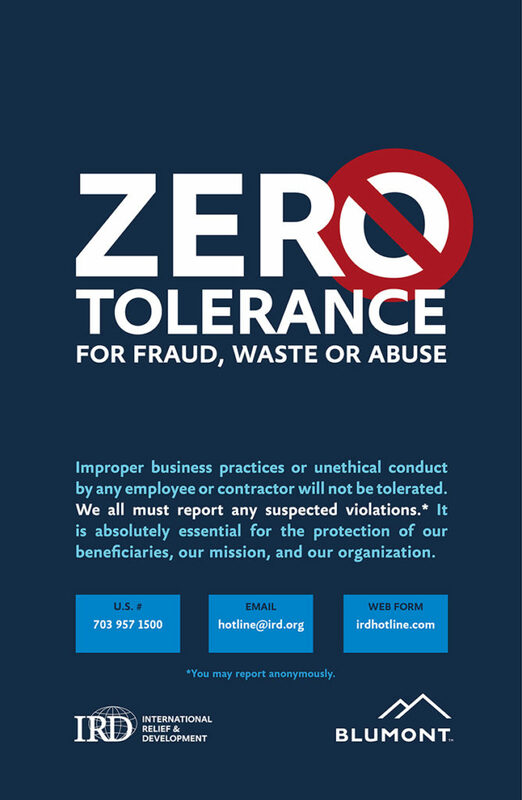 To underscore our commitment to meeting these standards in a fully transparent way, we have updated our Code of Business Ethics and Conduct and made it the core of our organizational culture. 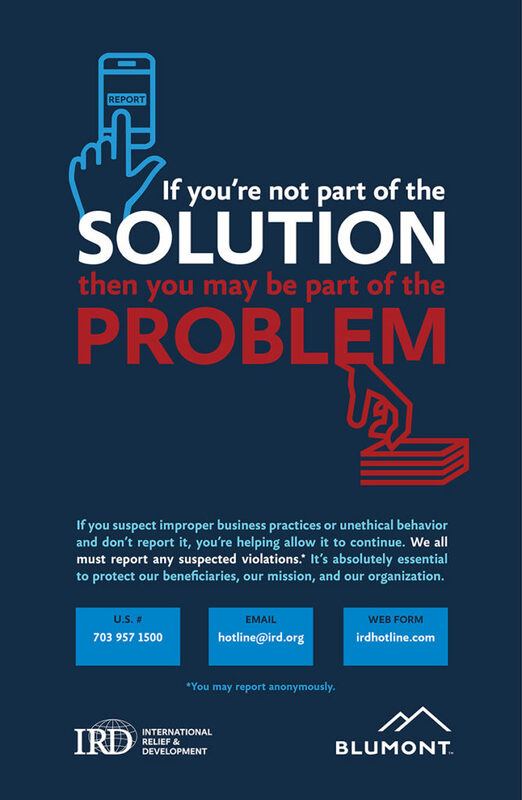 Compliance training is provided to all employees, and each of us plays a crucial role. All IRD/Blumont employees and consultants are required to read, understand and periodically review the Code’s stipulations and to help enforce them (by reporting potential violations, if necessary). 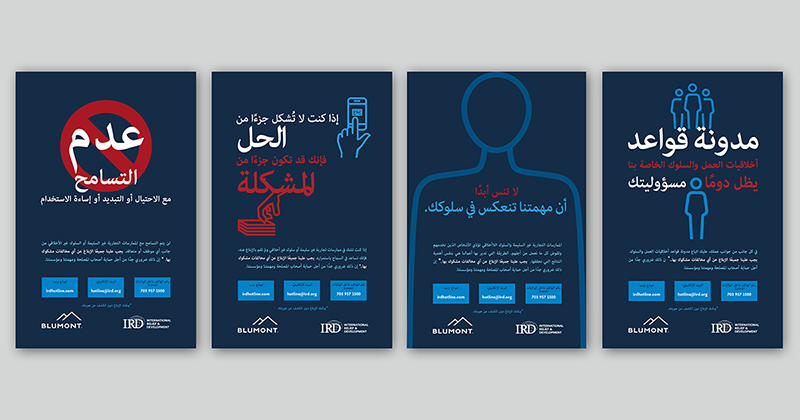 As a further reminder of our shared responsibilities, new compliance posters—in English, as well as Arabic, French and Spanish—are being shipped to all our offices around the world and will be prominently displayed. 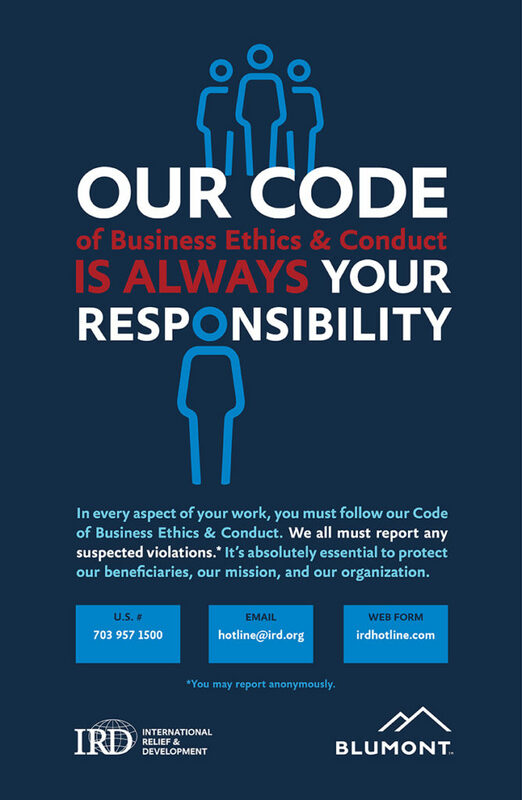 We follow both the letter and the spirit of the laws and regulations that govern our business, but the ultimate guidance comes down to simply “doing what is right.” As such, the Code lays the groundwork for our behavior at IRD/Blumont and the manner in which we approach our work. It presents the principles and standards of business conduct expected of all employees wherever we operate, providing us with practical guidance on how to deal with important ethical issues. It also includes resources that can be consulted when confronted with situations for which the most appropriate course of action is not clear. 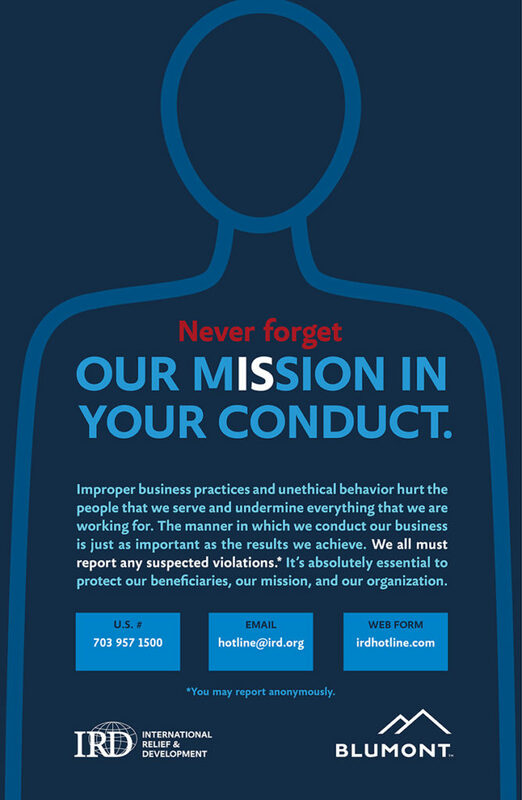 Any conduct not consistent with our Code demeans our mission, reduces donor confidence in our ability to perform, and disrespects our beneficiaries. It is therefore crucial that all of us remember to uphold its principles at all times.